Sulthan Bathery is a quaint town located in Wayanad district of Kerala. The famous Edakkal caves which also means "A stone in between" is situated at the northern region of Wayanad called Ambukuthi Hills, 10 Kms from Sulthan Bathery. The caves are considered as one of the earliest centers of human habitation. This was said to be formed by a large split in a huge rock thus holds two chambers. The caves are famous for paintings and carvings on rock which portrays values of stone age civilizations. Edakkal caves can be accessed only though a 1 km trekking trail from Edakkal. In the first chamber there are lots of pictorial carvings that depicts the existence of various tribes. Morning hours are the best time to be at Edakkal caves and it closes by 5 pm. 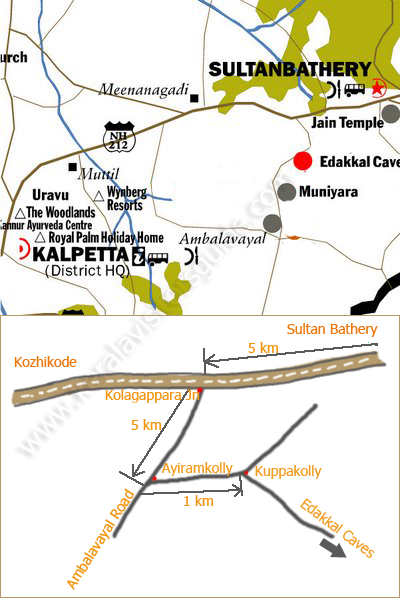 Below is a route map we collected to Edakkal Caves from the nearest city, Sulthan Bathery. Spacial thanks to Chins for the Post. Kerala is an Indian state located on the south-west India formed on 1 November 1956 by combining various Malayalam speaking regions. 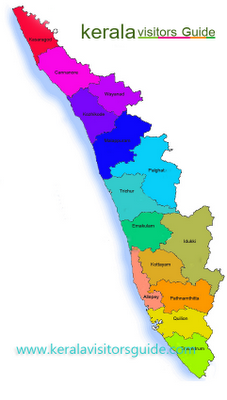 The state has an area of 38,863 km2 (15,005 sq mi) and is bordered by Karnataka to the north and northeast, Tamil Nadu to the east and south, and the Arabian Sea on the west. The city of Thiruvananthapuram (aka Trivandrum) is the state capital. Kochi (Cochin), Kollam (Quilon), Kottayam, Thrissur (Trichur), Palakkad (Palghat) and Kozhikode (Calicut) are other major cities in Kerala. According to a recent survey by The Economic Times, five out of Ten Best cities to live in India are located in Kerala. Kerala is a popular tourist destination for its backwaters, yoga, Ayurvedic treatments, Spices and tropical greenery. The Kerala Government Tourism Department, a government department in charge of promoting tourism has adopted the slogan God's Own Country for its campaigns.